Are you in the midst of planning for a tenant improvement (TI) project or working on one as we speak? We can help! Our team has loads of experience with these type of projects and it always seems to be that they usually don't have room for a bin. Space is always an issue with TI work in high rise buildings or retail locations and we can offer an easy solution for you. We can work with you on planning your project from the minute you start budgeting to the end when your start focusing on your finishes. With our experience, we feel our recycling stations would help streamline your waste as they help sort the recyclables from the actual garbage and it's very easy to manage. This also allows for a faster removal of the material from the site. When you choose to work with us, we are available 24 hours 7 days a week. We have found that a lot of tenant improvement projects happen on weekends and late evenings as well. We are more than happy to work with your schedule to get the job successfully completed for you. With having multiple trucks on the road we can make sure all your waste is removed right away making sure you meet your deadlines. In regards to setting up an organized garbage area, we can consult and train your employees on how to make sure all waste is properly disposed of as well as educate your team on what type of recyclables go where. 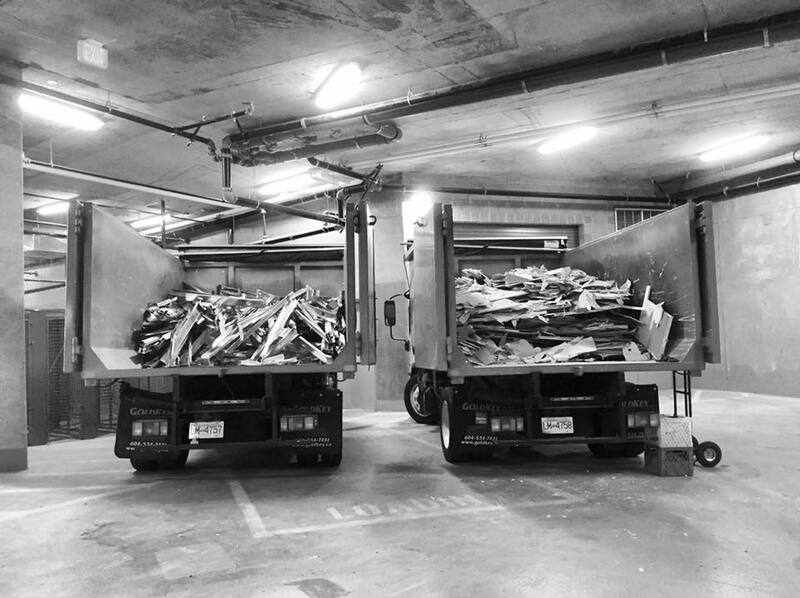 Lastly, a pickup area, keep in mind that we can load from anywhere especially a loading bay where there is some space to deliver the waste from your job by laborers or we would be happy to come to the site and load waste in the elevator as well.